IN the ancient back alleys of Tibet's capital, Lhasa, a grim military operation has played out this week, hidden from the eyes of the world. As night falls, hundreds of Chinese troops fan out across this rebellious city, armed with riot shields and assault rifles. These patrols spend the night walking down the lanes of Lhasa's Tibetan quarter, looking for any signof dissent. They glare at me asthey pass, angry at the presence of a foreigner. When the sun rises, the soldiers do not melt away, but are replaced by a new rotation of troops. 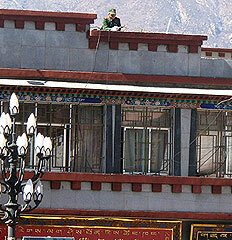 The military stranglehold on Lhasa by day is maintained with one chilling addition -- snipers are installed on rooftops around the city's most holy site, the Jokhang Temple, ready to train their guns on the hundreds of Tibetan pilgrims praying in Barkhor Square below. Hopes of greater autonomy and freedom have been stifled by Beijing, which -- stung by bloody anti-Chinese riots in March and by the indignity of the subsequent Olympic torch relay protests -- has come down on Tibetans with an iron fist. During four days in Lhasa this week -- the first visit to Tibet by an Australian journalist since the March riots that left up to 200 people dead -- I witnessed a city creaking under the weight of the Chinese military. The heavy military presence betrays China's unspoken fear that it is losing, rather than winning, the hearts and minds of local Tibetans, who accuse Beijing of subjugating their culture and religion to preserve national unity. In an interview with The Weekend Australian, the vice-governor of the Tibet Autonomous Region, Bai Ma Cai Wang, reveals that China has recently boosted its security presence in Lhasa above and beyond the crackdown that followed the March riots. 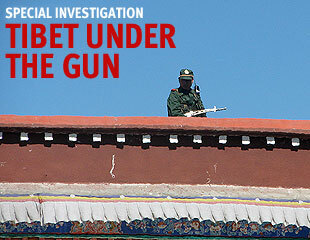 This is China's first public acknowledgment that it has beefed up its security forces in Tibet. "In order for Tibet's stability and for people's safety and for people's desire for security and order, the Government has moderately adjusted the presence of the police force on the street," he says. Bai Ma says the Government fears a repeat of the March riots, which he says were the work of the exiled Dalai Lama and his supporters. "After the March 14 riots, the Dalai Lama and his followers have speeded up their separatist activities." "The image of the Dalai Lama in Tibetan people's minds has already gone away," says Bai Ma. But the long lines of Tibetans waiting to pay homage to the tombs of former Dalai Lamas in Lhasa's imposing Potala Palace, and the thousands of passionate Buddhist pilgrims who prostrate themselves each day outside the Jokhang Temple suggest otherwise. I visited Tibet with News Limited journalist Steve Lewis and federal Liberal MP Michael Johnson, vice-chairman of the Australia-China Parliamentary Friendship group, at the invitation of the Chinese Government, which urged us: "Tell Australians what you have heard and seen about the truth in Tibet." It was only when we slipped away from our hotel at night and found some of the few Tibetans who spoke English that we heard alternative views. Even then they were reluctant to talk, fearing they might be seen or overheard by the authorities. One monk told us there were "more and more Chinese, more and more soldiers" in Lhasa in recent weeks. But no one will speak out, he says, because of fears they will be reported to the police. "Detectives, they listen to what you say ... sometimes (Barkhor) square is full of detectives listening in." He says Tibetans "feel very bad" about the situation but are powerless to stop it. Another monk claimed that the Chinese had installed listening devices in the main tourist sites where Westerners might interact with Tibetans, and said no one felt safe talking to foreigners about the political situation in Tibet. In meetings this week, Chinese officials quoted statistics showing vast improvements in the health, housing, wellbeing and life expectancy of the Tibetans. The Chinese Government has poured billions of dollars into Tibet's economy, with state subsidies accounting for 75 per cent of the gross domestic product. The problem is that almost all of this middle class in Lhasa are Han Chinese immigrants, rather than local Tibetans who are primarily herdsmen and farmers and lack the literacy skills and education to seize the opportunities created by the Chinese investment. "While a minority of Tibetans have been rewarded with state jobs, the majority of Tibetans, who are poorly equipped to access new economic opportunities, have been marginalised," says Ben Hillman, a Tibet expert from the Australian National University's China Institute. So the frustration of local Tibetans goes beyond the eroding of their culture and traditions under Chinese rule -- it is also an economic development issue similar to many around the world where an indigenous people are marginalised by more commercially successful immigrants. "The education program in Tibet is still not satisfactory," says Wang Jinjun, vice-director-general of the State Council Information Office. "The policy now is to better tackle the issue of herdsmen and farmers." Tibetans have only themselves to blame for this, because so many of them supported the riots, in which 1317 people were arrested, says Wang De Wen, of the Tibet People's Congress. The riots "were organised by Tibet separatists headed by the Dalai Lama and his followers, who are not willing to see the great leap forward in the development of Tibet, so they instigated violent incidents which involved the smashing, the grabbing, the looting and the setting fire to shops," says Wang. "This violent incident has wreaked havoc on the economic situation and the life of the Tibet people and has cost 320 million yuan ($70 million) since March." The deputy secretary-general of the Tibet People's Congress, Tonga, was reluctant to talk about those who were detained after the riots, but claimed the majority of Tibetans involved now regretted their actions. "After our re-education program most of them will regret what they have done," Tonga says. When pressed further on what this means he adds: "A relevant government official briefed them on what was right and what was wrong." Tibetan officials we spoke to denied all claims that the religious freedom of Tibetans was being curtailed. The head of religious affairs of the Tibet Autonomous Region, Kalsang, denied widely reported views in the West that monks were required to denounce the Dalai Lama as part of "patriotic education" programs in monasteries. He was partly contradicted several days later by Wang Jinjun who conceded that monks in Tibet were being given "legal information programs" in which they were told not to mix religion with politics. The Chinese dismiss the Dalai Lama's repeated assertion that he seeks only greater autonomy for Tibet, rather than independence. When I ask whether China's problems in Tibet might be eased by granting greater autonomy while still retaining national control of the region, Wang Jinjun is dismissive, saying it would return Tibet to its feudal origins. "Tibet will not be reduced to a backwater society which features theocratic rule," he says.